make fun all you want, but, virtually every night, in northwest phoenix mountain area, we see several "unusual" lights/aircraft in the same general area of the sky; their movement is very erratic and non "airplane" like, moving quickly, stopping, then moving in a different direction. There is no doubt that out here, in the desert areas, there is weird aircraft flying around at night, either US military or alien, who knows! .... virtually every night, in northwest phoenix mountain area, we see several "unusual" lights/aircraft in the same general area of the sky; their movement is very erratic and non "airplane" like, moving quickly, stopping, then moving in a different direction. A mirage is a naturally occurring optical phenomenon in which light rays bend to produce a displaced image of distant objects or the sky. An example. This is a time exposure so the apparent movement of the lights gives a line of light. Notice the erratic movement? 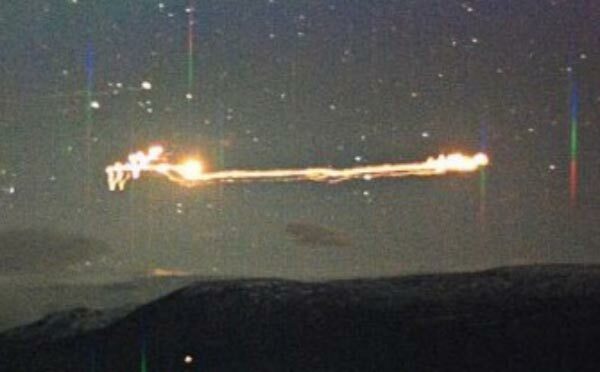 Last edited by 303Guy; 04-06-2018 at 03:31 PM..
i thought the same thing, but they are small, focused lights, the kind you would see coming from an aircraft of some sort..sort of like aircraft landing lights, so who knows.. I just called Luke AFB, to ask about some late night flyovers happening the last week or 2, and they told me they are doing some nighttime maneuvers this month, but I didn't ask about those lights, as they sure dont look like F35's flying around the sky..
https://mic.com/articles/126303/wher...tes#.mh8cviEtJ Are they residents of one of these states? That could be too. I wonder whether the mirage effect could make the lights appear erratic even though the source is approximately where they seem to be? As the aircraft moves into a different mirage effect zone, the craft could appear to move at extraordinary angles and crazy speeds. Good stuff! This kind of realistic, logical and reasonable explanation is much needed. Thanks. Sadly, few people make an effort to search for the truth through logical thought process. Last edited by davidt1; 04-06-2018 at 04:12 PM.. I wonder whether the mirage effect could make the lights appear erratic even though the source is approximately where they seem to be? Watch this mirage business become the new "its a weather balloon or swamp gas" explanation. Watch this mirage business become the new &quot;its a weather balloon or swamp gas&quot; explanation. The FAA is aware of military flights but that does not mean they are aware of classified aircraft or their flights. Frankly it does not usually matter because the military does not need, nor usually wish to, take classified aircraft into commercial airspace. I am not sure what was reported but I would not rule out classified aircraft. It would be very careless for the military to hand over information on classified aircraft test flights to so many people IMHO. I agree that the FAA might not be privy to classified info. I live in an area with very crowded airspace, with the natural barrier of the Colorado Rockies, including the 14,000+ ft Pikes Peak to the west. To the south is the massive Fort Carson along with the 235,896 acre Army Piñon Canyon Maneuver Site Which hosts 5,000 troops for training twice a year. To the north is the USAFA. When I was a little girl I used to go on base with my dad & watch the new cadets wobbling through the sky in their gliders. Peterson Air Field is to the southeast, as well as the civilian airport. NORAD is tucked into Cheyenne Mountain just to the south of Pikes Peak & the top secret Shriver AFB is to the northeast. All of the bases except Shriver have entrance gates that border right up to city limits. Growing up here, none of us questioned lights in the sky, contrails, or the booms that would echo down the front range from Piñon, because those were everyday occurrences. In fact, there were many kids like me in my neighborhood, who had been born overseas on military bases. Most of them had been born in Germany, while I was born on Tachikawa AFB in Japan, because Dad was stationed at Fuchu with the PACOM ELINT Center (PEC) during Vietnam. I guess I’ve just always assumed there was good communication between the FAA & the military but classified would be a different matter.